"Have you ever considered developing algorithms for inferring character states for taxa that are missing data? I looked at phytools and did not see an application that does this." Well, first of all, at least one method in phytools, the function ancThresh for ancestral character estimation under the threshold model, does allow for uncertain tip states by permitting input of known states or a matrix of prior probabilities on tips. In the case where data were totally unknown (i.e., missing) we would just provide a completely uninformative prior probability distribution for the state. It is relatively straightforward to use the same general idea if sampling ancestral character histories using the method of stochastic character mapping. As discussed in prior posts (e.g., 1, 2) it is easy to get the marginal probabilities from joint sampling of ancestral states using stochastic mapping. I have posted an updated version of make.simmap that can take as input either a character state vector of a matrix of prior probabilities for tip states. Implementation of this was surprisingly easy. First, I modified the internally called function apeAce - in which I have adapted code from ape's ace to compute the scaled conditional likelihoods for internal nodes. 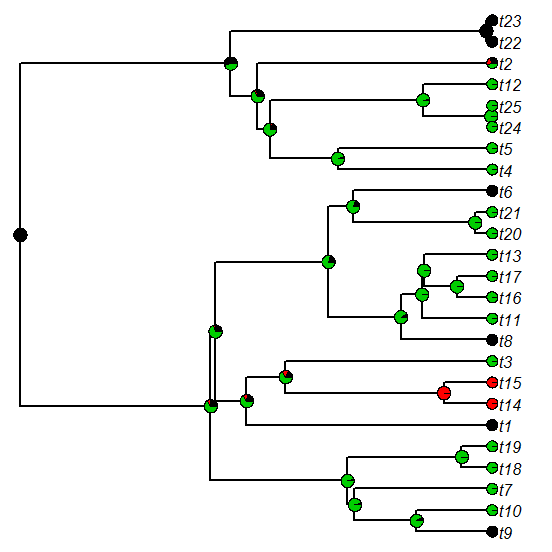 Here, I just need to adjust the code slightly so that we use the prior probabilities for tip states during post-order tree traversal during the pruning algorithm. Next, I modified the mapping code so that tip edges are treated the same way as internal edges. In this way we can assign node and tip states stochastically via pre-order tree traversal in the first step of the mapping algorithm described in Bollback (2006). Piece of cake! One of the interesting features of both this method & ancThresh is that it allows us to estimate the posterior probability that uncertain tips are in any state. "a" "c" "c" "c" "c" "a" "b" "b" "c" "a" "c" "c" "c" "c" "b"
"c" "a" "c" "c" "c" "c" "c" "c" "a" "a"
Finally, let's do stochastic character mapping (and estimate ancestral states) using either our true data, or our data with uncertainty and missing data for some tips.